Alex Simpson submitted this photo and caption. This is a photo of Ethan Wagoner and me, Alex Simpson, on the left. Ethan and I were in the front ensemble (synthesizer and timpani respectively) for the Troopers and had the job not only of driving the pit equipment trailer everywhere, but also riding on the back of it onto the field for shows. It was a blast being the first ones on and the last ones off the field every night and staring down the crowd. 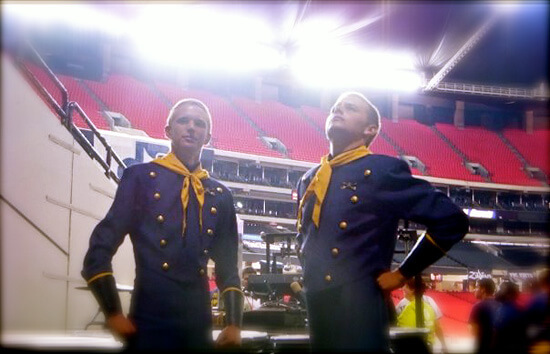 This picture was taken right before entering the field at the Georgia Dome in Atlanta.